Have you guys used these ceramic brushes by tek? They're the first of its kind and I'm kinda obsessed! If you don't know about ceramic technology, The general idea is that The ceramic nature helps distribute heat evenly which helps avoid thermal shock. The Ceramic is poros which helps close the hair follicles and gives you an ultra shiny look. It also has an ergonomic wood handle (temperature resistant) and is set with temperature-resistant and professional-grade bristles. Another non-hair must-have because I like giving you guys insight into how I keeep sane and healthy so I can run my business well! Plus you guys...I'm so obsessed with minerals and gem stones! Aren't these kind of magical? This is a premium glass bottle with a gemstone pod you can switch out in the bottom! They also have pods for beauty, balance, purity and love! Okay what's a 3-in-1 hairspray exactly? This stuff lasts all day, gives you shine and guards your hair against uv! Guys! Have you seen these on my insta yet? This is a new product collab I just launched with Pink Pewter and I'm so excited to share more! Perfect for all my non braiders and braiding buddies alike! 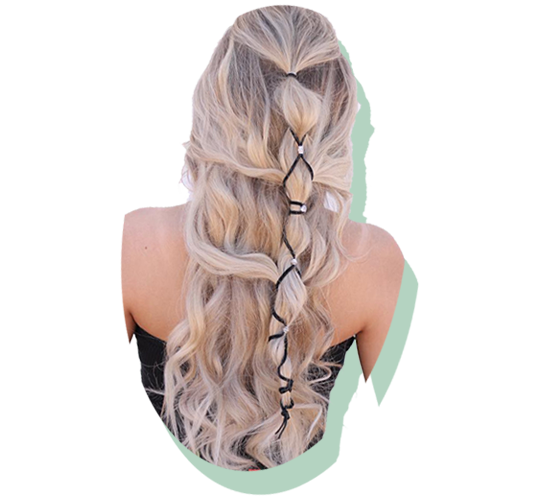 These straps are a bohemian-inspired product that I created to help you get festival-ready looks even if you don't know how to braid!